In the few years I have been using Reason, I've slowly started to build a default combinator that I can use for my drums, next to a default combinator that I use for all other instruments. In this walktrough, I'll show you how to build my ReDrum Combinator, and how to effectively use it. I'll go trough each of these functions and explain how I made it possible. I won't go into exact settings for the effects and instruments, you can adjust this to taste. If TL;DR, there are two combinators at the bottom of this page; but you might not know how to use it effectively, and you might find it difficult to expand on this combinator. Make a combinator, the first thing you'll do is add a 14:2 mixer. The thing I do next is output all the different channels into ECF Filters, and connect these into the mixer at the top. Then bypass all the filters, so they don't modify the sound before you want to actually use them. It doesn't make a big difference, so I'd say it's up to personal preference if you prefer them stacked horizontally or vertically. Easy enough so far, right? The best part about doing this, is whenever you now want to add an effect to a single drum hit / sample (lets say you want to add a delay to sample #7) all you have to do is drag a delay effect onto filter #7 and it will wire it up for you, without having to flip the rack, and without taking up a valueble aux-effect in the mixer. Sometimes you've got a drum sample that just doesn't really punch trough the mix as you'd like. You could raise the volume, but then you might be raising frequencies of the sound you don't want emphasised (like low end on a hi-hat, albeit unusual, it might happen). My solution for this is using NY-Style compression. All it really is is a sample, beeing split into two outputs, one going into the mixer, the other going trough some EQ and then routed into a compressor, which in turn goes back into the mixer. It's simple enough to use the 14:2 mixer for this, which is what I do. and one for the bass frequencies below. 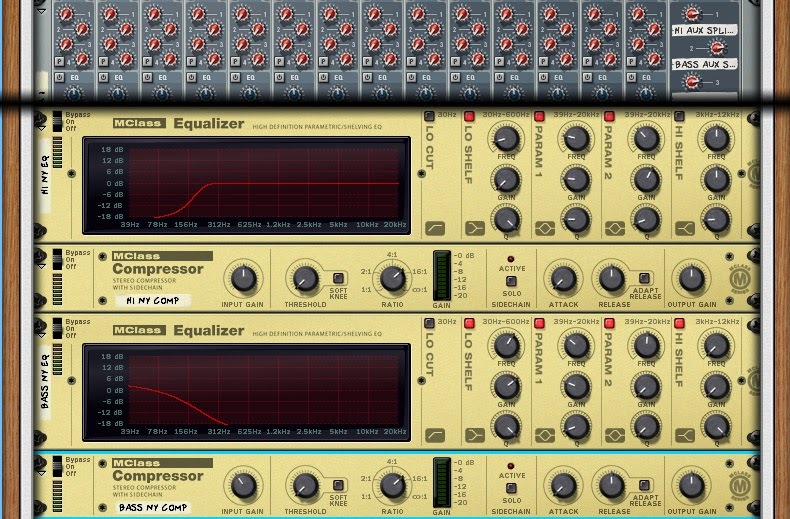 After that I route both EQ's into seperate M-Class Compressors, with a low threshhold and a pretty high ratio. You can see the EQ and Compressor settings I used, but like I said, adjust to taste. At the top of the image, at the right side, you can see the two compressors show up in the first and second auxiliaries of the mixer. Be sure to name your compressors HI NYCOMP (or something) and LO NYCOMP, according to the EQ that goes before it. either raise the first AUX send on the drum channel, for the hi's, or the second to raise the bottom end. Sometimes I even do both, just be sure not to push it too far. You're trying to get a wee bit more punch and volume, not actually change the sound in any way. You've got seperate effect channels ready to go without the need of any routing, and you've got NY-Style compression to get your drums to really blast trough the mix. Quite useful already, if I say so myself! 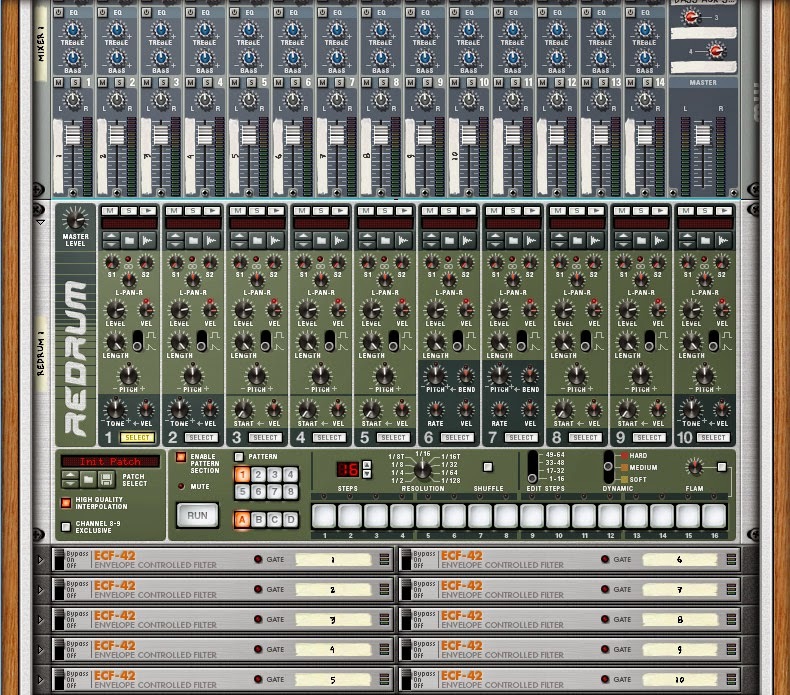 The last step gets a little more technical, we are gonna route some of the ReDrum channels to a splitter and back in to the mixer, so we can easily use these for sidechaning basslines or other melodic elements. This part gets confusing really quick, especially once you already have the combinator set up this far, because it involves a LOT of cables, and flipping the rack right now might already give you a headache. Don't fret, though, the actual theory behind it is relatively simple, and once you have it all set up, you'll probably never have to give the wiring a second glance. Plus once you're done, you should be a tad more pro-efficient in wiring things up in the rack! The first thing to note is what samples are we gonna be sidechaining with? The thing I most commonly see and do, is when the kicks and snares get sidechained. The first part is without any sidechaining. The second half has a low threshold - high compression on the synth. The difference should be very audible. The kick and snare must always be placed in the same slot on the Redrum. Otherwise instead of sidechaining from a kick, all of a sudden you are sidechaining from some other percussive element, which you don't want your fat bassline to pump along to. Well you might, but usually, that's not what one wants to do. Sample 6 - 10 for all other percussive elements, hi-hats, reverse snares, fx, ect. Some might say it's counterproductive to have set locations to put your drums, but I find it very usefull, especially when going back to old files. Your kick and snare midi location will be the same across all of your songs. Now for the actual splitting. For this trick we're gonna need a total of 6 Spider Audio merger & splitters. Name them Kick 1, Kick 2, Snare 1, Snare 2, Sidechain x2 and Sidechain x4. The first thing you want to do is remove the output from sample 1, 2, 4 and 5. These should be routed to the filters 1, 2, 4 and 5, if you followed the tutorial from the start. Connect the first output from Redrum into the rightmost input into the respective Spider Audio merger & Splitter. (That would be Kick 1, on the side which states A(L), and B(R)). Split it back into the filer you just de-coupled, also split it into Sidechain x2 and Sidechain x4. Split the second sample output in Kick 2, doing the same, but skip splitting it into Sidechain x2. Split Kick 2 back in to Filter 2 and into Sidechain x4. By making a difference between sidechaining with both kicks, or just one kick, you can disable sidechaining for your off-kicks, if you just use the second ReDrum slot to play off-kicks. going into Snare 1 and Snare 2, respectively. Then Snare 1 goes back in to Filter 4, and Sidechain x2 and Sidechain x4. Snare 2 goes into Filter 5, and again, only Sidechain x4 so you can choose to sidechain the second sample or not, as with the kicks. You're ReDrum template is now ready to use in most (electronic) forms of music! Be sure to save it when you are done! If you want to actually test it on an instrument, create any type of synth / sampler, make it play a long note, and add a compressor. Be sure to have a nice beat running in your redrum before you do this. Now connect either Sidechain x2 or Sidechain x4 into the Sidechain inputs from the compressor. Turn the Threshold all the way down, and the ratio all the way up. To change the effect and duration of the sidechain pump, you can adjust the attack and release knobs. Play around with it and see the way it changes the entire way your tune sounds! These are two example templates, one that includes the sidechaining, and one that doesn't. You can download both and compare them, which might help in understanding the process. One might say that 10 drum samples isn't a whole lot, and I must agree. I actually use this combinator, but with two redrums, and two mixers. All it really needs is a bit more splitting (3 more Spider Audio merger & splitters), one to get the NY sytle compression to work on both mixers, and another to combine both mixers into one sound output. I'm not going to post this, as I believe once you get a grip on the single ReDrum Template, you should be able to expand it into a double version yourself. It'll be good practice too, as it means you really have to dig in to the cables. Well, thanks for reading, and I hope you got a better understanding of wiring in Reason!